This is the largest collection of Darwin's handwritten manuscripts and private papers ever published. Read an overview of Darwin's papers and manuscripts: Click here. 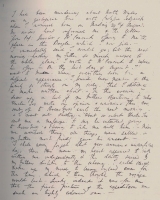 Read about the online launch of Darwin's papers here and here. We are extremely grateful for the kind permission of Cambridge University Library, which holds the largest collection of Darwin papers, to reproduce many of these online. They are presented in the same sequence as the original catalogue, which is divided into bound volumes, each with a library call number. Items from other institutions are interleaved in this list next to related material. For a list of manuscripts transcribed on Darwin Online click here. For previously published transcriptions click here. 'a "Zoological walk" to Portobello' 1826-7. [Minutes of the Plinian Society recording Darwin's first scientific papers] (3.1827). 1827-1831 'Students Bills' records Darwin’s weekly commons or buttery (meals) account in College. [Cheque by Charles Darwin 'to self' (Union Bank of London)] 1872.03.21. David Stanbury collection, Old Library, Christ's College, Cambridge (catalogue). Census Returns of England and Wales. Entries relating to the Darwin family for 1841, 1851, 1861, 1871, 1881 and 1891. [Outline of the 1842 sketch of species theory]. Draft of Power of movement in plants (1880). Draft of Formation of vegetable mould (1881). Notes for above paper. Also cuttings on the subject from Gardeners' Chron. of 26 May 1855. Copy in Francis Darwin's hand (corrected by Darwin) of 'The Action of Carbonate of Ammonia on Chlorophyll Bodies'. Fish in spirits of wine: 20 pp. Insects: 2 pages, & letter: C. C. Babington, 1 July 1837. [Darwin's Beagle animal notes (1832-33)]. 'Fish in Spirits of Wine' [Beagle animal notes] (1832-1836). 'Shells in Spirits of wine'. [Beagle animal notes] (1832-1836). Notes made on Beagle, 1832-1836, on Shells. Catalogue of boxes of corallines [10 small pieces of paper]. Insects in spirits of wine [one sheet]. 'Table for Lind's wind gage for Captain Fitzroy of H.M.S. Beagle'. Mammalia in spirits of wine. Birds, etc. in spirits of wine. Notes on the preservation of specimens. Geological diary: (Falkland Islands, in comparison with Henslow's account of geology of Anglesea). Geological diary: [geological specimens 1625-1692, descriptions]. Geological diary: Elevations on coast of Patagonia. Geological diary: Re-examination of the transition fully confirms very thing I then said. Geological diary: Attempt to find general inclination of the bottom of the sea off the coast of Patagonia. [list of specimens collected, numbered 1948-1997]. [list of specimens collected, numbered 1801-1830] / Passage of Animals & upheaval. Geological diary: S. Cruz / Transportal of Gravel. Geological diary: The more I reflect on Stratification & Cleavage the more difficulties I find. Geological diary: Bay. N. of Orange bay. Geological diary: East coast of T. del Fuego & Sts of Magellan. Geological diary: At C. Espirito Santo, high cliffs commence. Geological diary: From S of St Sebastian to St Pauls head. Geological diary: Chiloe. June-July. 1834. Geological diary: Elevation of the plain of the Plazilla (calculations). Geological diary: "Former Lemoos." — Jan. 6th . — Lat 44°: 30'. Geological diary: First of Chonos Islands (Midship Bay). 'Chiloe Janr. 1835' [Beagle field notes]. Geological diary: Comparative statement of the export of Nit[rate] of Soda alias Saltpetre. Comparative statement of the export of Nit[rate] of Soda alias Saltpetre. Geological notes made from Capt Fitz Roy Specimens collected on the coast. Geological diary: Old Callao/ Examined site / extensive - ruins. Geological diary: Bay of Islands, New Zealand. (12.1835). [List of reptiles and amphibians from the Beagle] (1832-1837). Referee reports on Newbold, Rock basins and Phillips on caves, elephant bones and pumice. (10.1842). MS. on the Geology of the Falkland Islands, by B. J. Sulivan. Lists of geological specimens. Humboldt Personal narrative vol 6. 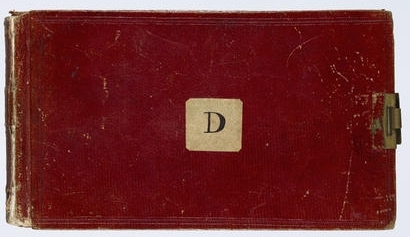 Cape de Verds notebook (1-6.1832). Buenos Ayres notebook (11-12.1832-2.1833; 12.1833). St. Fe notebook (9-11.1833; 3-4.1835). Banda Oriental notebook (11.1833, 4-5.1834). Port Desire notebook (1-4.1834, 11-12.1834). [Darwin's Beagle diary (1831-1836)] transcribed by Rookmaaker. Also transcribed in F1925. Cross cleavage & conversion of clayslate in gneiss show that original cleavage planes determine mineralogical planes. I may also remark that generally where the cleavage of the Mica Slates is not well developed. When writing on Cleavage refer to p. 37 of Hopkins abstract memoir. Humboldt Personal narrative VII: 52. Humboldt Personal narrative VI: 586, 25; Notebook RN pp 84, 105, 124. Humboldt Personal narrative IV: 384. Notes on seeds of flowers (including hollyhock & stock) & vegetables, 'Comparison of seeds, flowers, legumes, etc. to see effect of selection and of non-correlation'. Notes on origin of cultivated plants, abstracts & a list of alpine plants not found in arctic Europe. Notes for 2d ed. of Journal of researches which 'may be useful in species theory'. Scraps & notes for 'Transitions of Organs', i.e. chapter 8 Natural selection [chapter 6 in Origin 1859]. See F1583. Last sketch [on bees' cells]. Note on Waterhouse / Brief outline of theory illustrated by Diagrams. Last sketch [on bees' cells continued]. Rough draft made for W. Kemp 'An account of some seeds buried at a great depth. . .which germinated.' F1918 with correspondence on the subject. 'Abstract of Views on Glacial Periods', by J. Croll. Notes & diagrams on phyllotaxy . Notes on peloria & on fertility of Antirrhinum, 1862-5. Hypothesis of Pangenesis. [5.1865.] Also transcribed in F1578. Draft of a discussion on organs not being formed by direct action of medium in distinct organisms. Sent to G. H. Lewes, 1868. Ideas for experimenting some Galtonian measurements, 1873. Romanes's paper on abortion, with draft of Darwin's reply, & letters printed in Nature on the subject, etc., 1874. Notes & letters concerning Torbitt's experiments on potato disease, 1876-. Additional photographs for Expression of the emotions, drawings, notes & references of chs. 2, 3, 6, 7, introduction, memoranda; cuttings from Nature & other publications. The immersion of leaves in a solution of sugar [draft of `Insectivorous plants' pp. 293-4] (1874-1875). Material for Insectivorous plants (1875). Notes on (1) castings; (2) furrows & ploughed land; (3) experiments done at St Catherine's Hill, Teg Down, & Stonehenge. Notes of experiments on habits of worms, many in the hand of Francis Darwin; notes on experiments carried out at Silchester, Chedworth, Abinger, Leith Hill & Stonehenge, with diagrams, plans, calculations, & photographs. Notes on the Roman Villa at Chedworth by Buckman & R. W. Hall, 2d ed. (1873). Memorandum on Chedworth (15 Nov. 1877). Notes on bloom on leaves & fruit, which remained unfinished at Darwin's death. Notes on researches into bloom on leaves & fruit. Notes on researches into bloom on leaves & fruit. Scraps on bloom. Late notes on leaf secretion & ants. Notes on: sleep in plants; salt water; effects of shaking stems of plants. Notes, etc., & proofs for supplemental note for Descent of man (1877). Letter: 'An Irishman', 13 June 1877. Translation of 5th ed. of Origin of species into French, including notes which are possibly by Asa Gray. Notes for correcting 6th ed. of Origin of species (1872). 2d ed. of Coral Reefs (1874), 3 maps, Commander W. J. S. Wharton's note on Rodriguez & Zanzibar, Charles Smith's notes on S.W. Pacific, proofs of plates, & cuttings from journals, etc. Notes by Darwin & others for 3rd ed. of Coral reefs (1889), with a map of Great Barrier Reef, an extract from Blackwood's letter to Beaufort (20 Apr. 1843), cuttings, etc. 2d ed. of Climbing plants (1875), including cuttings, proofs of plates, & notes by G. H. Darwin on Climbing plants. 'Macculloch. Attrib of Deity' [Essay on Theology and Natural Selection] (1838). Wilson `Botanical Society of Edinburgh' : 32; Magnus `Bot Verein Brandenburg'; Wallace `American Naturalist': 161; Hollis `Journal Anat Phys'; Hoffman `Botanische Zeitung'. Wallace A.R [Remarks on the habits, distribution, and affinities of the genus Pitta]; Baird; Coues; Swinhoe; Blyth; Salvin `Ibis' 6 1864-5. Abstracts of scientific pamphlets & journals. Includes an index of abstracts of '4° and 8° pamphlets': Gardeners' Chron. ; Bull. Geological Soc. ; Geological J.; Annals of the Soc. of Natural History; Trans. New Zealand Institute; Kosmos; Proc. & Trans. Zoological Soc. ; Linnean J.; Trans. Linnean Soc. ; American Naturalist; Philosophical Trans; J. Anatomy & Physiology; Proc. American Philosophical Soc; Annales, Soc. Entomolog. de France; Mind; J. Anthropological Institute; Proc. or Mem. of Boston Soc. of Nat. Hist. (sic); Proc. American Academy of Sciences; Proc. Royal Soc. for Advancement of Science. Material used in Cross and self fertilisation (1876) includes scraps, memoranda, notes of observations, tables of calculations, references to articles in journals. Material for 1st ed. of Descent of man (1871). References to books & articles by other writers. Index to a work by C. L. Brehm. Index of books used. Baines; Pordage; Wallace; Bonte; Pruner-Bey `Anthropological Review' 1866 and 1867. Wallace, `Narrative of travels on the Amazon' II: 276, 314. Material for 1st ed. of Descent of man (1871). Darwin, C. R. Wallace A.R 'On the Pigeons of the Malay Archipelago' Ibis 1865. Darwin, C. R. Wallace A.R `Travels': [various]. Humboldt Personal narrative IV: 515-522, 416. Early notes on guns & shooting. 'Old & useless notes about the moral sense and some metaphysical points written about 1837 and earlier' (1838-1840). Autobiographical fragment, 'written August 1838'. Misc. material originally found with notebook for 'Books to be read'. 1838, DAR119. One loose sheet originally with 'Catalogue of the Scientific books read by Darwin in 1846'. Draft of a sketch of A. R. Wallace's career, 1881. Fair copy of autobiography, & list of Darwin's works. Notes on reading Sumner's Evidence of Christianity. the proper proportion of shot [Notes on shooting]. Instructions for Young Sportsmen [Notes on shooting]. 'Life. Written August — 1838' [An autobiographical fragment] (8.1838). 'Send for Archives du Mus d'Hist Naturelle vols 5 and 6 [and other works]'. 1853. [Buckley, A.] . [biographical and bibliographical notes on A. R. Wallace]. Recollections in preparation for Life and Letters. Pamphlets, offprints of Darwin's articles and articles by other authors (1835-1882). A collection of 16 botanical and geological pamphlets (1838-1879). State of New York. Senate, no. 64 (2 Mar. 1840); Assembly, communications from the Governor concerning the Geological Survey of the State. 4 numbers, dated: no. 150 (17 Feb. 1841), no. 161 (11 Feb. 1873), no. 200 (20 Feb. 1838), no. 275 (27 Feb. 1839). Material concerning Darwin's death & funeral, including: M. J. Savage: Darwin (Boston, 1882. ); report of committee of Darwin Memorial Fund (1888); the anthem, mourners, family procession, tickets, etc. Caricatures of and posthumous articles on Darwin & Cambridge University, Chancellor Masters and Scholars (Invitation to join in the commemoration of Charles Darwin) June 1909. Humboldt Personal narrative vol. 4: 527. 'Vol I p. 291 Again Mr Jenner Weir informs me that a peacock at Blackheath'. .
Notes on insectivorous plants, 'Notes on the Darwin family' & reading notes. 472 images. 'Macculloch. Attributes of Deity Vol I.' . 'Mr Cuming thinks that a species variable in one place' (1845).
. [List of barnacles sent to the Copenhagen Museum]. NHMD-Barnacles. 'Work finished If not marry' [Memorandum on marriage]. (1838). 'This is the Question Marry Not Marry' [Memorandum on marriage]. (7.1838). [Emma Darwin's memo about Darwin's religious doubts] (c. 2.1839). Memorandum. Annuity for J. Parslow. [Notebook of observations on the Darwin children]. (1839-1856). 'Our poor child, Annie' [Darwin's reminiscence of Anne Elizabeth Darwin] (30.04.1851). Proofs of Darwin's books: Erasmus Darwin; Different forms; Power of movement; Climbing plants; Descent of man 2d ed. ; Expression of the emotions; Insectivorous plants; Cross and self fertilisation; Origin of species 6th ed. ; Origin of species 6th ed. 33rd thousand. 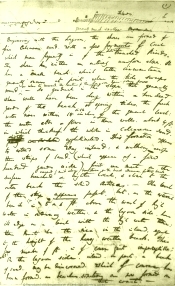 Draft pages from Origin, 1859, pp. 210-14, Chapter 7, 'Instinct'. Draft pages from Origin, 1859, Chapter 6 'Difficulties on theory' and pages 269, 271 of Chapter 7, 'Instinct'. Petition for the endowment of research, by J. Norman Lockyer and C.E. Appleton, signed by Darwin. [Lists of journals and reviews] 'Index to contents of Drawer / Catalogue'. 1881-1882. Last will and testament of Charles Robert Darwin. See also Darwin's Publications (which includes published manuscript transcripts) and Supplementary Works. Requests to reproduce manuscripts must be sent to the owner of the manuscript, not to Darwin Online. For those belonging to Cambridge University Library (i.e. those items named CUL-DAR or DAR...) contact Imaging Services mss@lib.cam.ac.uk. See the Cambridge University Library Order Form for Digital Images. If a work within the scope of Darwin Online is not listed here it is either in progress, a copy of the work has yet to be acquired or reproduction permission could not be obtained. Please help us complete the online collection. See our list of works still needed. There are also plans to include portraits and caricatures of Darwin and images of Beagle specimens and other objects. * Most of these descriptions are based on the 1960 Handlist of Darwin papers at the University Library Cambridge. These are, for the most part, greatly abbreviated descriptions of an entire DAR volume, necessarily omitting mention of many items, here intended to serve as an aide memoire. Volumes containing only correspondence are omitted from this list. Darwin's correspondence is recorded in the Calendar of the Correspondence of Charles Darwin. All of the items within each DAR volume are individually itemized in the manuscript catalogue. Thusfar about 11,000 manuscript images have been individually named according to the catalogue. Therefore many items are currently available only by browsing through their respective volume in the list above. We are particularly grateful to Sue Asscher and also to Katie Tabb and Arthur Koehl for renaming thousands of these images.